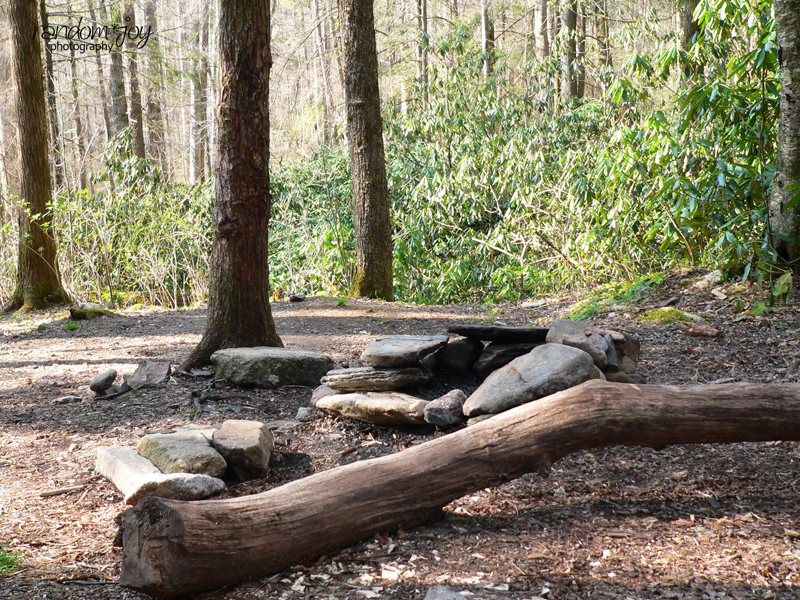 We know you've all been jonesin' for another trail report from Appalachia & Beyond. 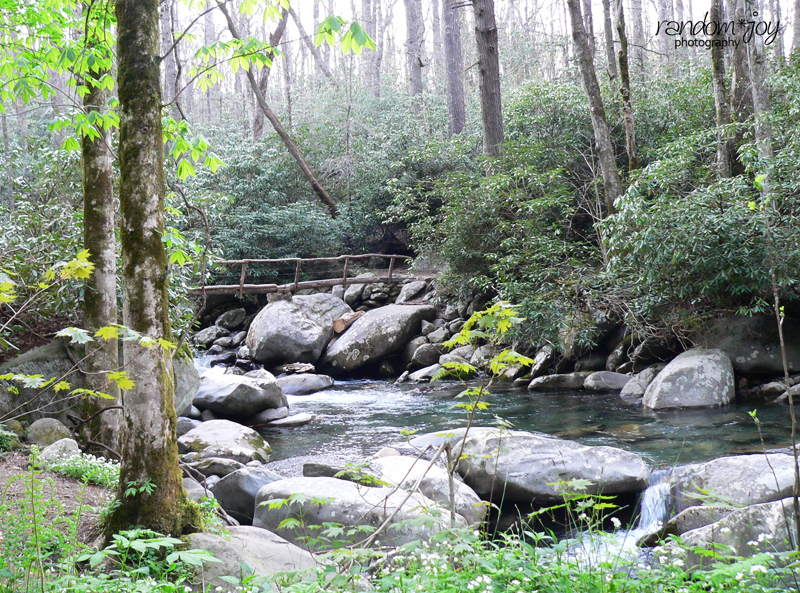 Well this week you're in luck as Robin and I headed out to Porter's Creek in the Greenbrier area of the Great Smoky Mountains National Park this past weekend. 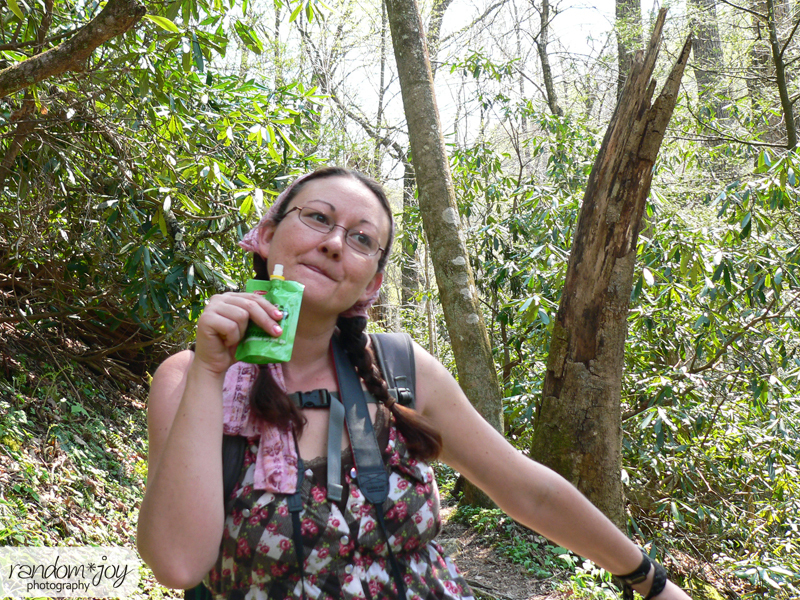 When I first queried Robin about hiking, she was game. Upon asking where she wanted to hike, she didn't have an answer other than, "I dunno, where do you wanna go?" Robin loves to answer questions with questions. It's more or less an avoidance or stall technique on her part. This time I was prepared with a suggestion. 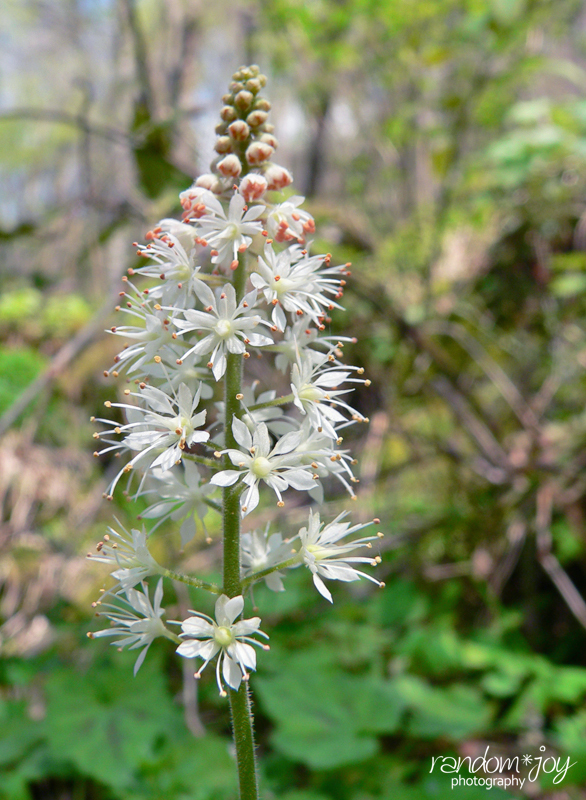 I figured since we went to Porter's Creek and walked the loop road around the trailhead a couple of weeks ago why not go back to see what new wildflowers had bloomed. So I suggested we hike the Porter's Creek trail to Campsite 31. Robin asked how far it was and I promptly replied with something along the lines of "It's 3 point something miles to the campsite making it 6 point something round trip." 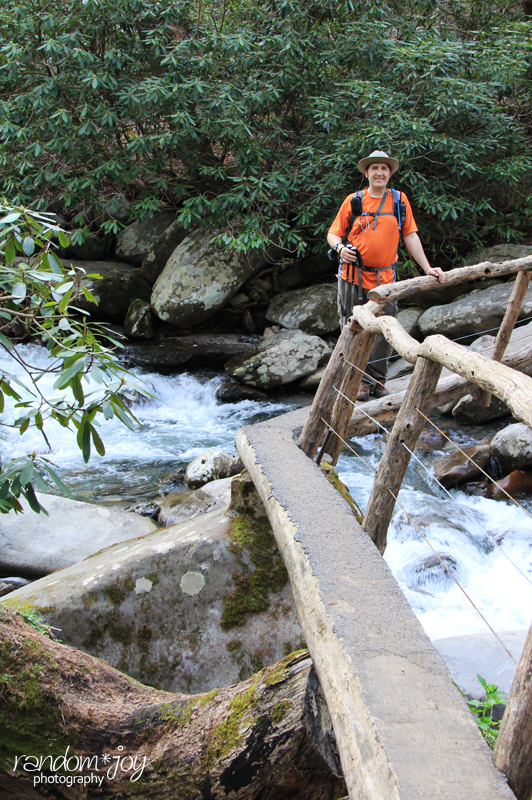 To add to this, I included that, "the trail is creek side the whole way." Robin, as well as I, thought that because of this it wouldn't be too bad of a hike, you know mostly flat and cool. I also mentioned that, "it had an elevation gain of 1400 plus feet over the 3. something miles so it would be a gradual climb, nothing to strenuous." To be quite honest, at the time I hadn't fully researched it, nor had I done the math to realize that it was actually a 7.4 mile hike. I'm sure had I known that and said so, Robin would have likely put the brakes on that trail or suggested we only do part of it. Yes, I'm definitely over ambitious when it comes to hiking, a point that Robin makes almost every time I mention hiking and suggest a trail. What can I say, I like a challenge. So the trail starts at the end of Greenbrier Rd. Upon reaching the trailhead there was no where to park and we had to park alongside the road, hoping that we wouldn't find a ticket on the window or worse no car due to it being towed. This was only a concern due to a sign stating no parking on the side of the road once we entered the loop road to the trailhead. Once we got parked, we geared up and were ready to head down erm... I mean up the trail. 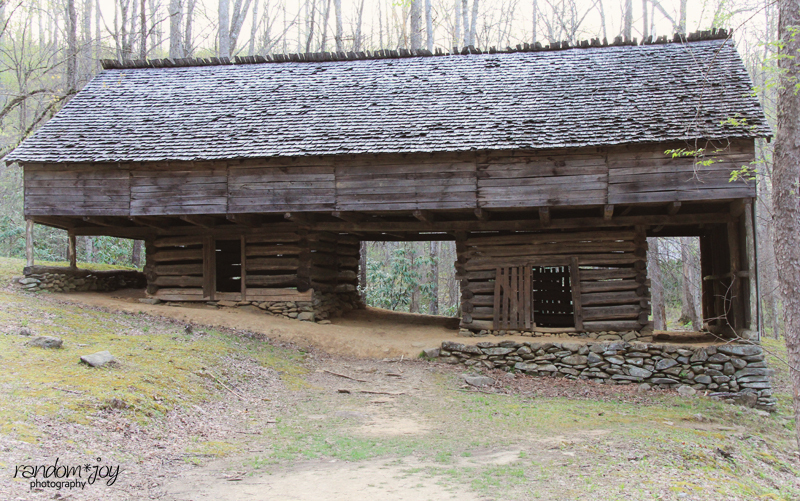 Porter's Creek was once settled by pioneers and farmers in the late 1800's. This is evident within the first mile of the trail as you see parts of stone walls marking where farmsteads once stood. 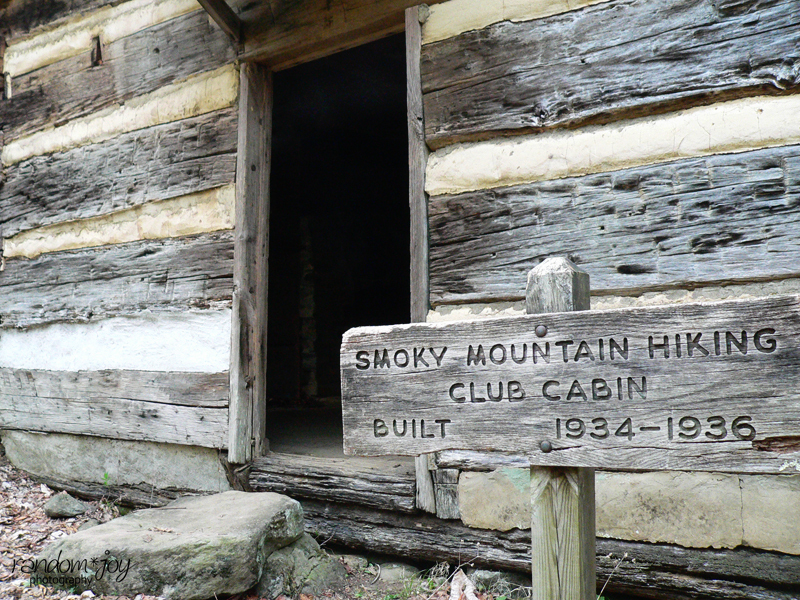 The first mile of this trail is filled with the history of these earlier settlers. Just past the first set of rock walls, there is a staircase on the right of the trail that leads to the remnants of an old farmstead, complete with a cistern and flattened area where a farm was once located. 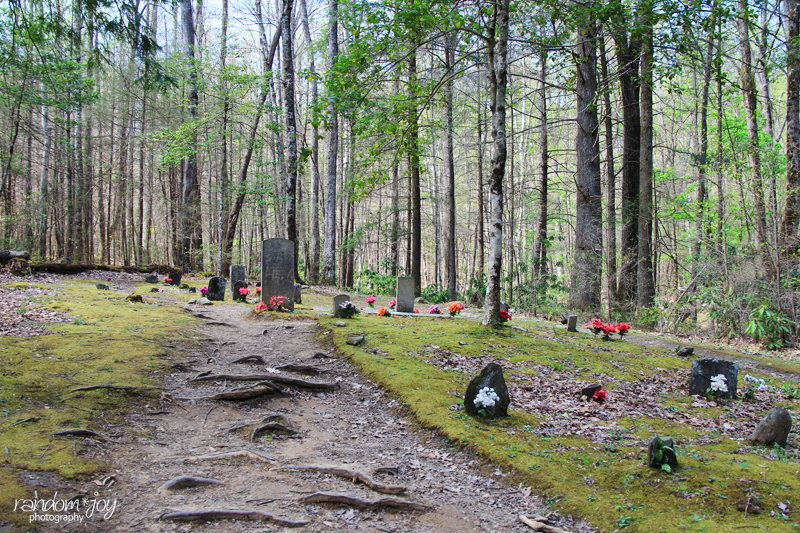 Just a bit further up the trail is another branch off to the right that in a few yards leads to an old cemetery. We have been on this part of the trail before, and due to the popularity of this part of the trail, we didn't linger very long. 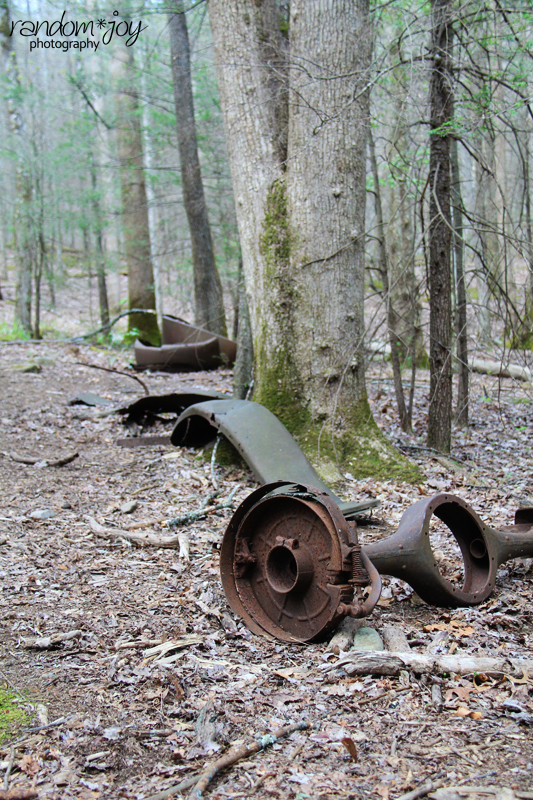 Another fifty yards or so up from the cemetery, is another path on the right of the trail that leads to the remnants of an old Model T Ford. The path is again but a few yards. This is an ideal place to stop for a small break as it is very well shaded. Additionally, if you aren't careful, you might pass the spot up as you only see the path from the trail, the car parts are hard to see from the trail. At this point you are only a tenth of a mile from the split off the trail back to the Messer farmstead. More about this later as we didn't stop there at this point. This is the most popular destination on the trail and considering it was still early afternoon, there were entirely too many people which means no good shots of the place with the camera. 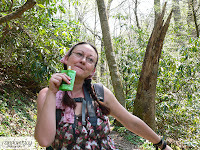 Of course Robin and I had plenty of shots taken by this time as the trail is literally carpeted with all sorts of wildflowers such as different Trillium varieties, White Phaecelia, Crested Dwarf Iris and much more. 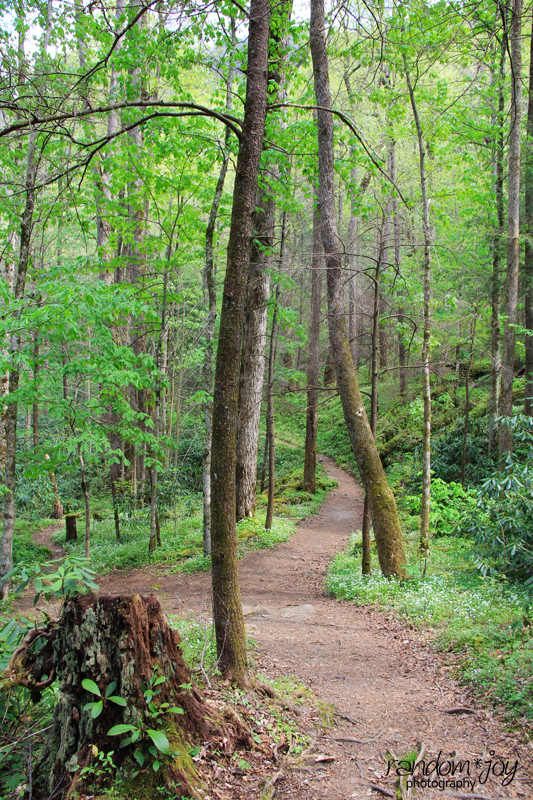 Along this portion of the trail you also cross two bridges. One is a regular bridge that park vehicles can pass across. The second bridge is a foot bridge that crosses the creek. The creek at this point is shallow enough to ford yourself if you so desire. 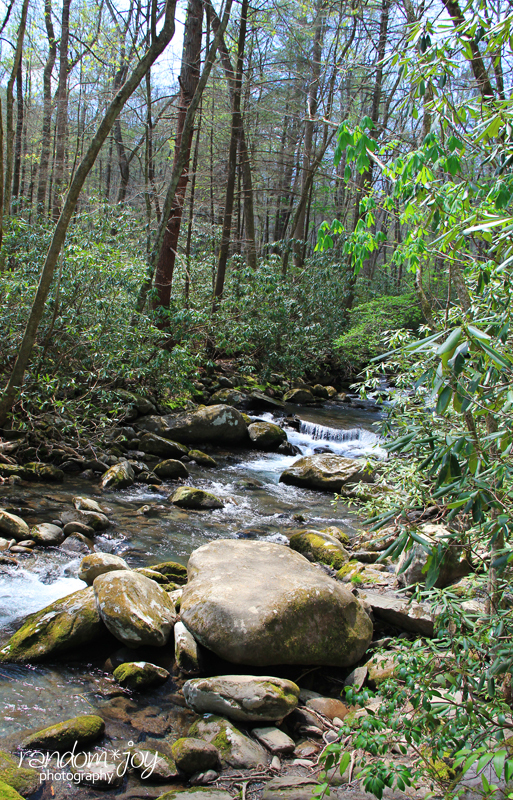 This is also a great place to hunt for salamanders. 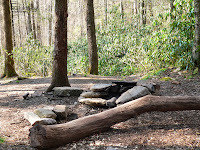 At the cut off to the farmstead, you can opt to go right to the homestead and the Brushy Mountain Trail, or you can stay left and continue up the trail towards Fern Branch Falls and ultimately to backcountry campsite 31. 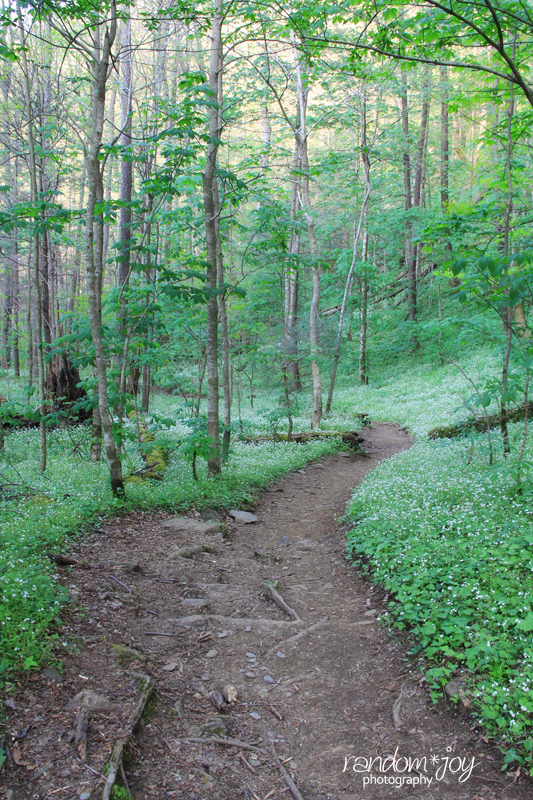 The trail from this point is no longer gravel road but actual trail and becomes rough with rocks and roots which is typical of the Smokies. About a half mile past this point is the second footbridge. This is probably the longest and likely the scariest footbridge I've been on. Really I wasn't scared but I believe Robin was as once I reached the other side, after Robin already had, her only words were "heights, shaking bridge, and spiders." She was shaking like a leaf. Robin calmed down shortly after as she engrossed herself in the photographic opportunities at this point. More wildflowers, the rushing creek and the bridge made for a very picturesque picnic setting. This was also a great place to wade in the creek if one so desired, and as hot as it was, we probably should have. Considering we still had a mile and a half to go to the campsite and the hike back we didn't dally long. 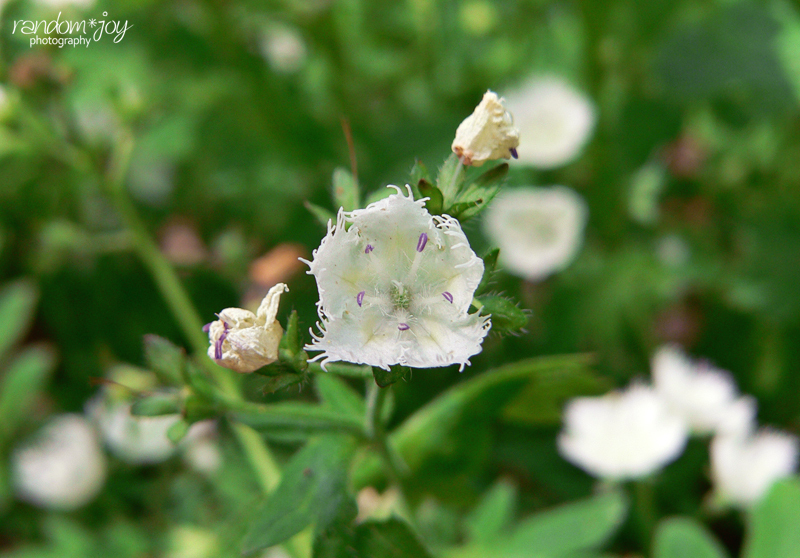 We continued up the trail passing the Porter's Flat area which was below the trail and carpeted with White Phaecelia. It was indeed magnificent. 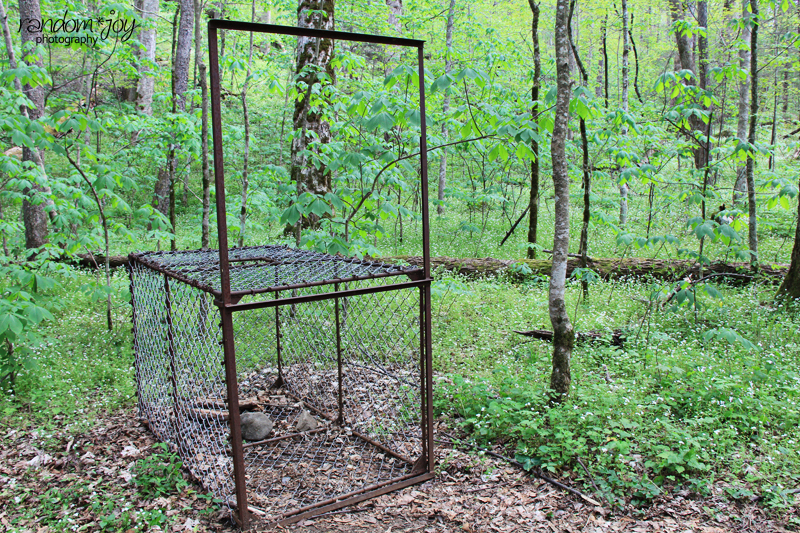 There was even an old bear trap on the side of the trail around this area which didn't sit well with Robin, but I assured her it wasn't being used any longer and there was no bait in the trap. I don't think that comforted her much as she is terrified of bears as much as she is spiders. Onward we hiked after several photos of the flora of the area. From the bear trap it's another half mile or so to Fern Branch Falls. This time of year is a great time to hike to the falls. The spring rains and snow melt had the falls flowing nicely. During the dry season, I hear it's barely a trickle if anything or plain rock face. We stopped here to rest as we were feeling the effects of the sun, the humidity, and the heat. 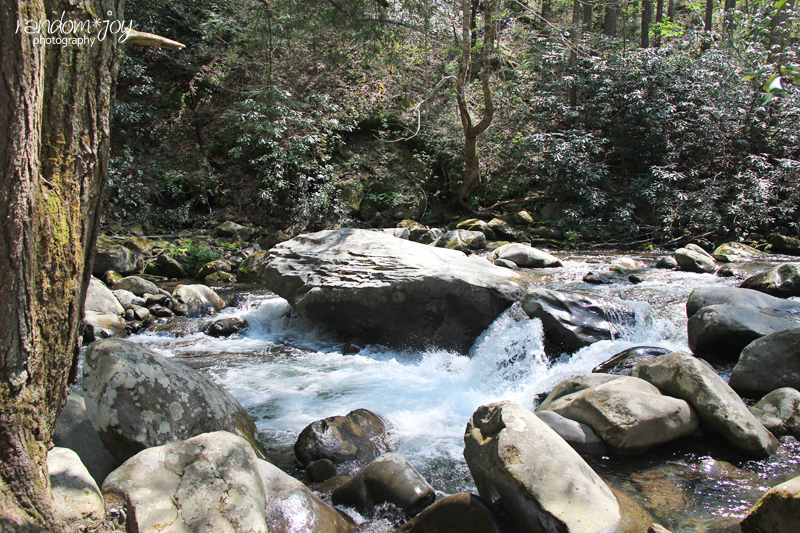 From the falls, it's another mile up the trail to the campsite. As we trudged along the trail, we wondered if there really was a campsite. It seemed to go on forever. Around every bend in the trail was more trail but we soldiered on like good little troopers should. Of course a snack on the go was required as the time was ticking and we still had what seemed a long ways yet to go. So we pulled out our GoGoSqueez AppleApple Apple Sauce . Once again it was just enough to get us both to wanting more, but provided enough of a boost to keep going. 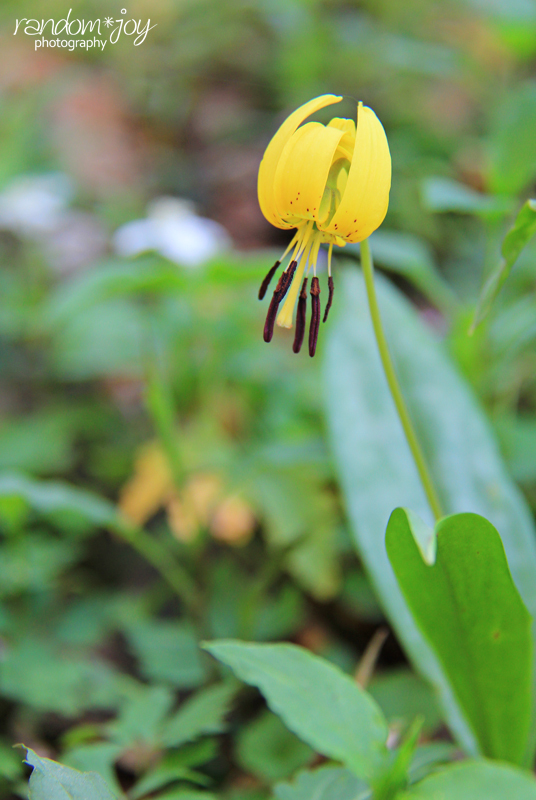 More flowers, more bends and more trail were ahead of us. We finally got to the campsite before realizing it when Robin stopped and was intent on not going any further. It was then that I looked and seen the marker showing that we indeed reached the campsite. Robin found a log in this area to sit down. She was content on sitting there while I walked around one of the campsites checking it out. There was one group in a campsite up from the trail, but I didn't want to bother them. I was content to look around the lower campsites and found there were bear bag hangers at the site. To be quite honest and to show how green I still am, I had never seen such a contraption before so I found it to be pretty neat. The day was getting long and we knew that we needed to get to heading back if we were to make it out by sundown. There's no way we wanted to be stuck on the trail in the dark, at least not until we made it back to at least the farmstead. We always carry flashlights with us but the trail past the homestead is just to rough. So we made our merry way back down the trail. A few hundred yards down the trail we met another hiker on his way to the campsite who looked as beat as we did. He asked how much further to the place, and we reassured him it just around the bend and he'd be there. I believe he was relieved to hear that. We chatted for a few more minutes and we all agreed the heat was just brutal. After the pleasant exchange we parted company and in no time were passing the falls again. We stopped for a moment or two to get a few more pictures as the light had changed and it wasn't as sunny in this area. We continued down the trail and were back to the bear trap before we knew it. We stopped here as well to get a few more shots. Again, on the way up the light was a bit brutal but now it had gone behind the mountain and provided more suitable light for photographing the scenery of the Porter's Flat area. We continued on and were back the long foot bridge. We knew at this point we could take a little more time as it wasn't far from the farmstead and we had plenty of light left. We took the time to grab a few photos of us on the bridge, and I played with slow shutter speed shots of the rushing creek. Robin on the other hand tried to figure out the video on her new camera so she could film the walk across the foot bridge. Unfortunately it's not as intuitive as one might think. We continued onward to the farmstead. With the time of day, we knew there wouldn't be anyone around and if there was there wouldn't be as many as earlier and thus more conducive for some nice shots. Additionally, the light was absolutely beautiful so Robin was bent on the fact that she wanted to get some shots of the cantilever barn as well as the old Smoky Mountain Hiking Club cabin. If it hadn't been for the light, we likely would have bypassed it and continued on to the trailhead. After getting the shots we were after we made our way back to the trailhead. As we came off the trail we met the same hiker we chatted with on our way down. He was a bit perplexed as to how he beat us off the trail as he didn't see us. We explained that we stopped off at the Messer Farmstead for some pictures. His look turn from perplexed to deflation at the mention of this. We learned that this was his second trip to the area this year and he still hadn't seen the place. We chatted with him a few more minutes and said our goodbyes. It was time to get to the car and head back home. We started the hike at 1:00pm and ended it just past 8:00pm. 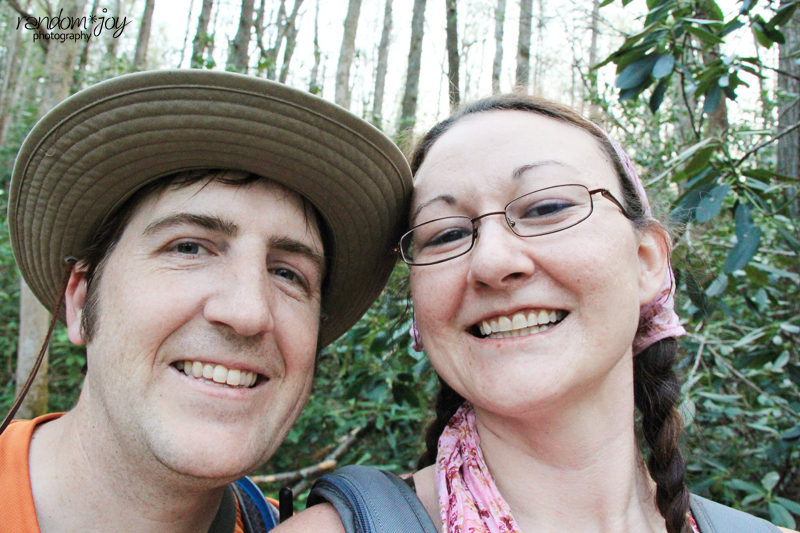 It was a great hike even if it did kick our tails. The wildflowers were amazing and made the trip well worth it, well according to Robin it was only worth it up to the falls, after that it was just pointless (haha). After all was said and done, the total mileage was 7.43 miles and total elevation gain was over 1500 feet. 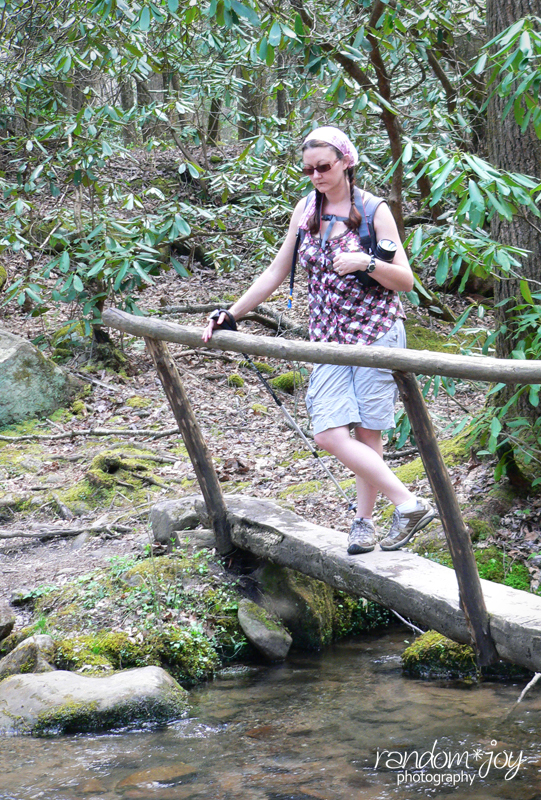 We considered the trail to be moderate to slightly strenuous. The slightly strenuous was likely due to the heat. 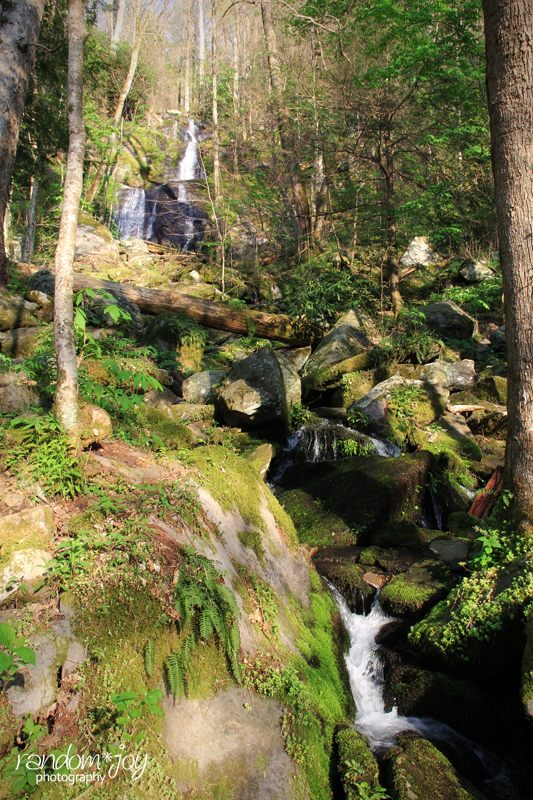 If you plan to make this hike during the late spring, summer, or early fall, be sure to bring plenty of water. You're going to need it. 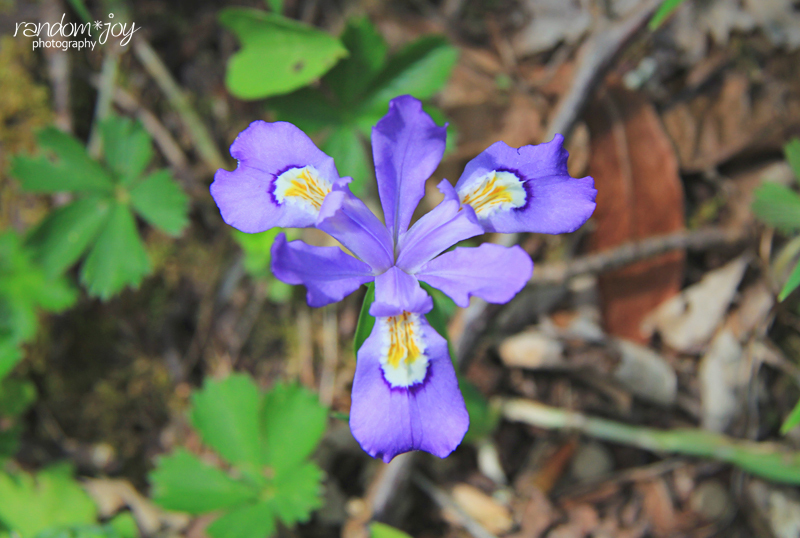 For more pictures of our hike, check out the photostream on our Flickr page.